Please click on The Week That Was. The newsletters for the current year are listed by date with key subjects. For prior years, select the prior year listed under Archives. 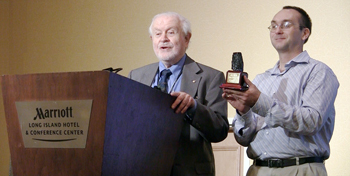 Accompanied by Jeremy Snavely, Fred Singer announces the SEPP April Fools award at the Annual Conference of the Doctors of Disaster Preparedness, Uniondale, NY, July 29, 2012. More Details about the award and video.